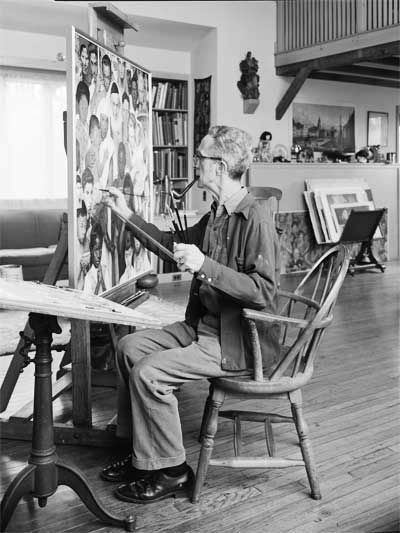 Rockwell at work in his studio on a cover painting based on his United Nations work, The Golden Rule. Of Note: The New England Foundation for the Arts has put together a list of Disaster Relief Resources for Artists and Performers. Call for Botanical Art Las Laguna Gallery (Laguna Beach, CA) is accepting entries for botanical art for their exhibition BotaniK. For this artist opportunity the gallery is seeking works that explore plants. Works that show flowers, plants, trees, leaves, cactus, succulents, etc. to be considered All local, national and international artists, professional and amateur and multiple art mediums will be considered in this call for art. Learn more. iPhoto The Plymouth Center for the Arts is pleased to announce the Fourth Annual I-Phonography competition; again celebrating the unique position that mobile devices play in the production of creative images. Last year this competition had exciting results with hundreds of submitted images, including international entries. Learn more. Arts Business and Marketing Artists based in Lowell, Lawrence, Dracut, Haverhill, Chelmsford, Tewksbury, Tyngsboro, and the Merrimack Valley can apply for the Art-to-Work Incubator, an entrepreneurial program aimed at artists and craftspeople who want to develop their products for a larger mass market. The program will offer matching grants of up to $2000 for qualified individuals, entrepreneurship training and mentoring for artists, craftspeople, photographers, makers, and designers. Learn more. Call to Artists The Arts & Business Council of Greater Boston is currently accepting applications for the Walter Feldman Fellowships for Emerging Artists, which supports artists under 40 producing 2D work other than photography. This includes professional coaching and their first solo exhibition. Learn more. Musical Theater Award The Richard Rodgers Awards were created and endowed by Richard Rodgers in 1978 for the development of the musical theater. These awards subsidize full productions, studio productions, and staged readings by nonprofit theaters in New York City of works by composers and writers who are not already established in this field. The winners are selected by a jury of the American Academy of Arts and Letters. Learn more. Photographers Entries are currently being accepted by the Art League of Rhode Island for their international juried photography exhibition Through the Lens. Learn more. Performing Artist Grants The NEST (New England States Touring) funds presentations of New England-based performing artists from outside of a presenter’s state. Learn more. Ceramic Artists The State of Clay is a juried show open to original, innovative ceramic work by current and former residents of Massachusetts. The aim of the show is to broaden public awareness of contemporary ceramic art and to provide a venue for Massachusetts’ clay artists. The show is hosted by the Ceramic Guild of the Lexington Arts & Crafts Society in Lexington, MA. Juror Emily Zilber will select awards in person and present a talk at the Artist Reception. Learn more. Printmakers The Center for Contemporary Printmaking’s Footprint International Competition 2018, is an opportunity for the presentation of current trends and innovations in contemporary printmaking within the bounds of the one square foot (12″ x 12″) configuration. All fine-art printmaking mediums, including woodcut, intaglio, lithography, screenprint, monotype, and original digital media may be utilized. (No drawings, photographs, or direct reproductions are eligible.) Art must be hand-pulled and generated using at least one traditional printmaking method. Computer generated art is eligible only if it incorporates other methods of hand pulled printing or handwork. Image size must be exactly 12 x 12 inches. Learn more.